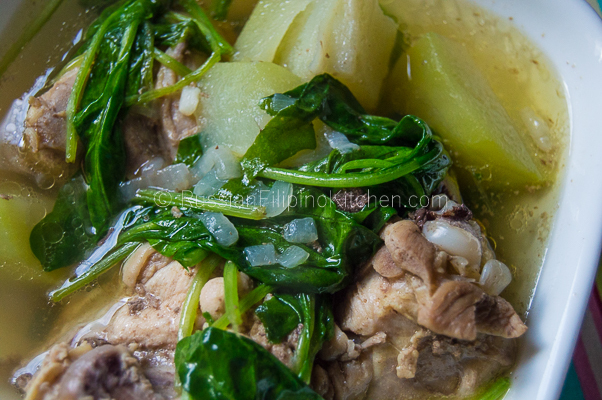 A classic Filipino soup made from bone-in chicken meat simmered in a ginger-based broth with added vegetables. Peel chayote, cut in half and remove seeds, then cut into wedges. Peel ginger, and slice thinly. Peel garlic and mince. Similarly, peel and slice onion. Heat cooking pot on medium high and add oil. Throw in onions and garlic and sauté until garlic has browned a bit and onions are fragrant and become translucent, about 2 minutes. Add ginger and sauté for a minute. Add chicken meat and salt. Saute for about 3 minutes. Pour in fish sauce and mix. Add water, chicken cube, and chayote wedges then stir. Cover pot and bring to a boil. Once boiling, turn down heat to medium low and simmer for 30 minutes, stirring once or twice to evenly distribute flavor. Once chicken and chayote are thoroughly cooked, add spinach and cook for another minute. Remove from heat and ladle soup into individual bowls and serve with rice.